*SPOILER ALERT* for Episode IX character designs and minor plot details!!! 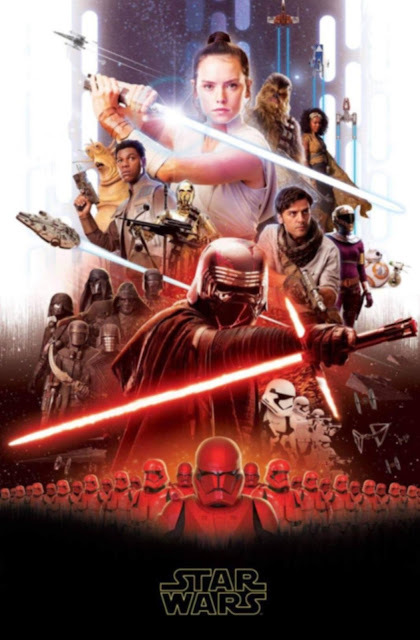 We're expecting a huge dump of Episode IX content—including the title, teaser trailer, and teaser poster—during its Celebration Chicago panel on April 12, but this morning we got one of the biggest leaks yet in the form of a poster and character collage image, via Reddit. Both images line up with the various leaks and rumors we've heard so far, so they're definitely legit. The poster doesn't have the title and is more crowded than the typical Star Wars teaser poster designs, so we can assume it's not the official teaser poster and we'll get different artwork at Celebration (as well as an official version of this one at some point). The funniest bit here is C-3PO wielding Chewbacca's bowcaster and with an ammo belt slung around his torso. This will undoubtedly be played for laughs in the film, though it's hard to tell if it'll just be one funny sequence or if Threepio will actually be blasting stormtroopers in multiple scenes. It's little surprise at this point, but it's still nice to have the Knights of Ren confirmed and get a look at their designs and weapons. Those red stormtroopers have been rumored for a while now. There are still regular stormtroopers visible too, so are the red ones some kind of special forces? Naomi Ackie's character is seen on both the poster and character collage, indicating that she'll have a pretty major role. 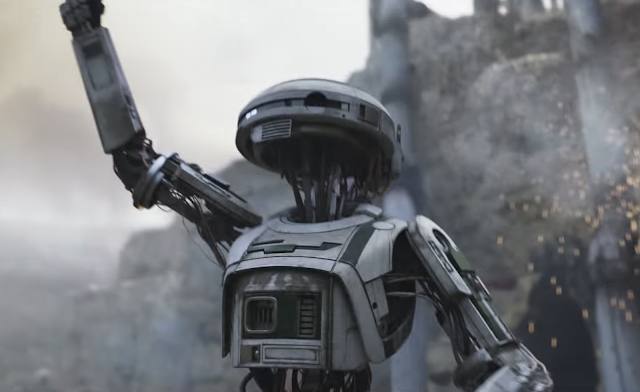 Her name is given as Jannah (seemingly condradicting the rumor that she was "Vera Calrissian," as in Lando's daughter), and the large bow that she's wielding hints that she'll be one to watch. Judging by previous rumors, the masked woman in a purple outfit named Zorii (as seen in both images) is most likely Keri Russell's character, a bounty hunter of some kind. (Russell even said in an interview last night that she has the "coolest costume.") Her position on the poster seems to place her on the Light Side, but her true allegiances will probably be more ambiguous. The top right corner of the poster confirms the return of classic A-wing and Y-wing fighters, as well as (of course) the X-wing. As first revealed by a character concept art leak last month, Lando's outfit is similar to the one he wore in Solo, but with a new cane. Perhaps the most major absence from both images is Rose. In fact, there have been very few rumors or leaks about her role in IX. Though we can still hold out hope that JJ Abrams will do her character justice, it's worth remembering that she's the only character in IX who wasn't originated by Abrams; her presence in the film is more of an obligation for Abrams than an active choice. What do you think of these images? Which character are you most looking forward to seeing? Tell me in the comments or tweet to @sithobserver, and may the Force be with you all.